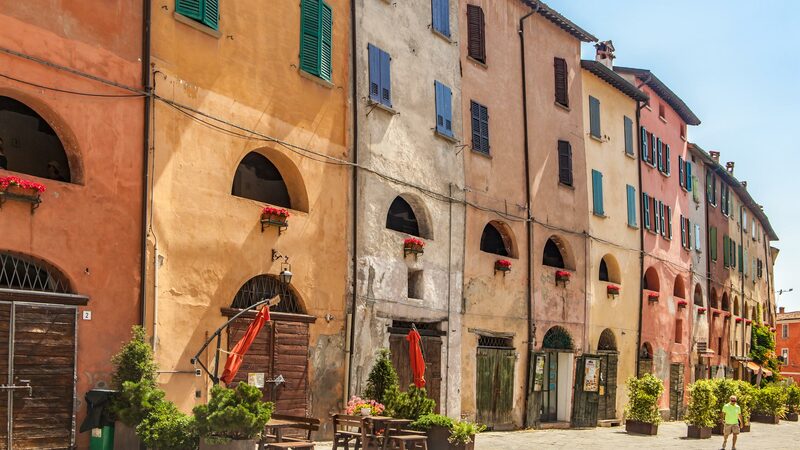 How, in the radiant heat of the June sunshine was this postcard-perfect, Instagram-friendly, insert-all-the-travel-cliches-because-its-true, Italian village practically deserted? Firstly, I’ll state the obvious: this medieval village is a photographers dream. Mainly thanks to the beautiful setting of mountains and vineyards that fan out from the village, and of course the multicoloured buildings and towers. But secondly, due to the lack of crowds to swan into your selfie. Other than weekends in peak-summer months, I was told Brisighella has somehow still managed to stay under the radar. 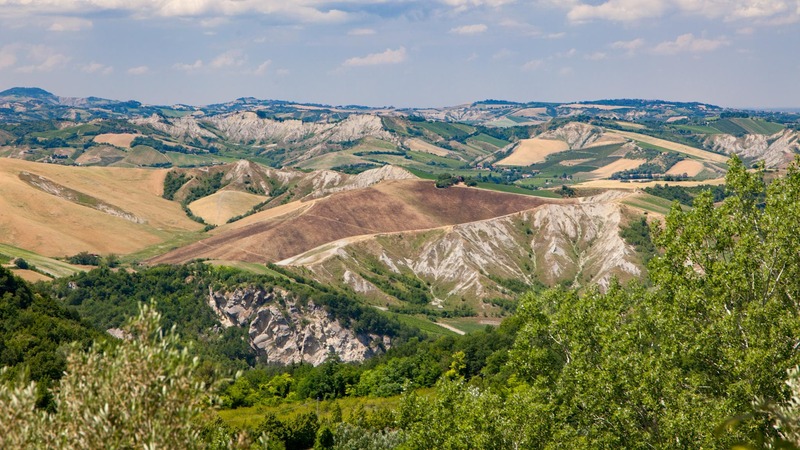 Here, at the Tosco-Romagna mountains which separate two of the countries most picturesque regions, you can delve into a romantic day trip or check-in for an escape to a slower pace of life. 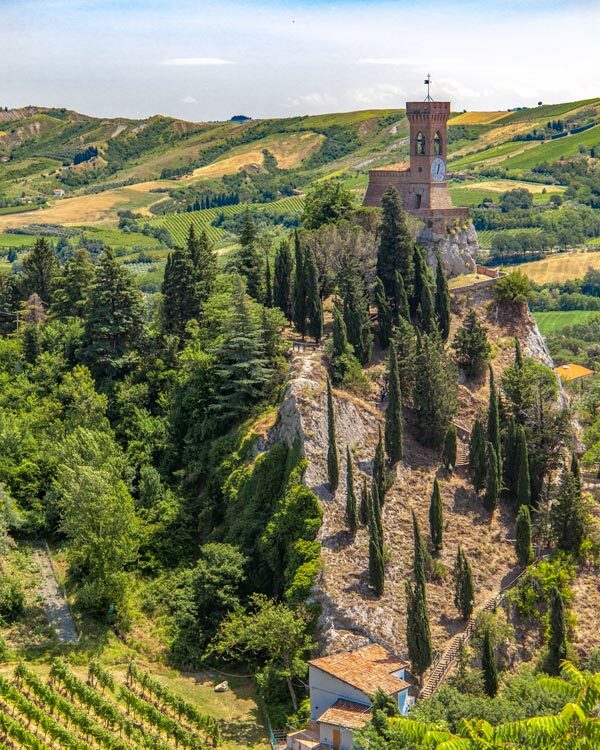 Brisighella, as is much of Emilia Romagna, is celebrated as a slow travel destination, and if you wanted to live the Italian countryside dream for a long weekend, I can’t think of many better destinations to do so. Brisighella might not boast a never-ending list of must-see attractions, but it’s for these reasons the smaller destinations in Italy capture my soul. Those lazy days sipping espressos in painting-flaking walled cafes, the joy of hearing a rich Barossa wine tumble into a fine wine glass, the mouth-orgasms that Italian cuisine leaves lingering on our tastebuds: Italy is a country to salivate over slowly, not a quick one-night stand. 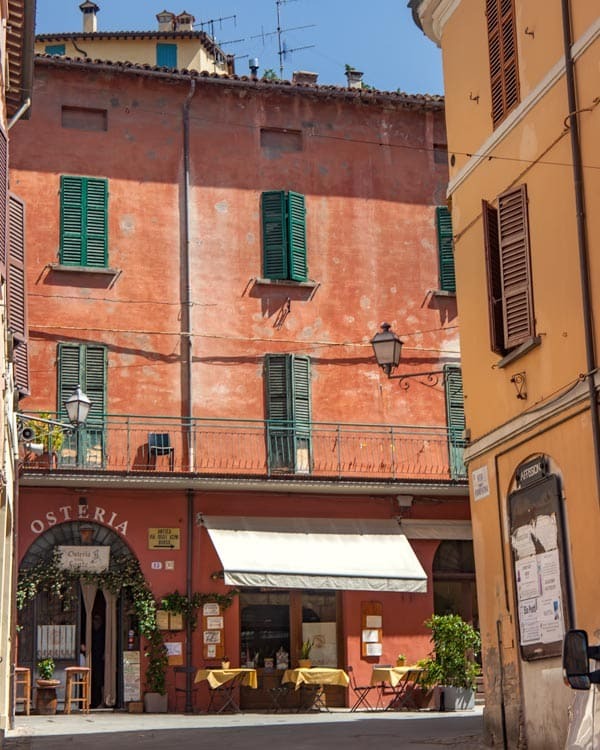 That said, Brisighella still has plenty to keep those who venture her way entertained, and these are some of the top things to do in Brisighella proper. The three hills that highlight the edges of the village each have their own structure dating back to a different century. On the rock you’ll find the 14th-century castle, well preserved and now offering an interactive insight into its history. As you walk into different rooms, booming voices will echo from speakers and make you jump like your under attack (just me?). You can take a guided tour around the property or discover it yourself. I think so of the most impressive views of Brisigehlla are from the turrets here. The clocktower is the most modern of the three structures, having been built in the 19th-century. If you walk up from the village by foot following the dusty winding staircase, this will be your first arrival point. It’s certainly a lot larger up close than it looks from the village and again, it provides some stunning vantage points. 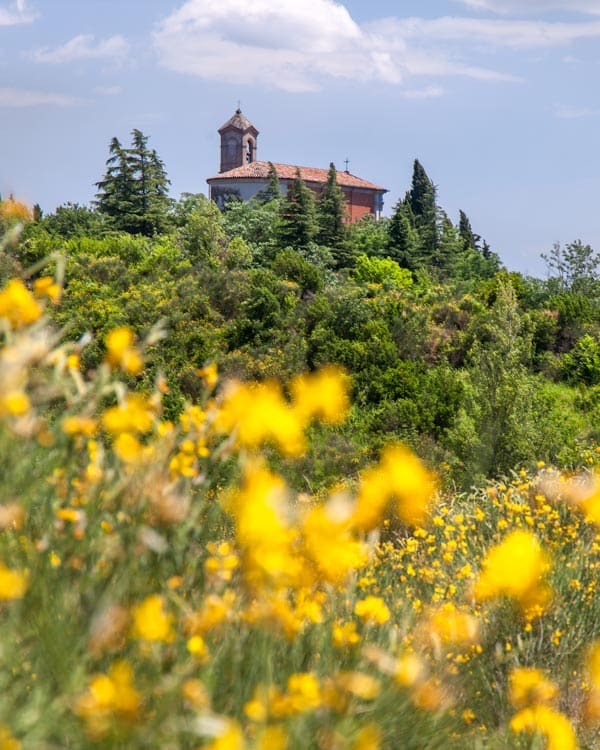 The furthest in the distance is the 18th-century religious sanctuary, the Monticino, but your walking efforts will be rewarded if you can visit inside. The building has been constructed over the centuries, but a church was in this spot before the current 18th-century structure that resides here now while the facade has been rebuilt again since, the ornate frescoes inside date back to 1854. Known as the Donkey’s Street, this old wooden beamed walkway is easy to miss, sitting just to the right of the staircase to the clocktower. On the level up from the street, this 14th-century defensive walkway would have had horses in stables underneath, while households had their homes behind the arched windows. Nowadays, families still live here, though the defensive purpose is no longer required, and the stables have long gone in favour of cafes. 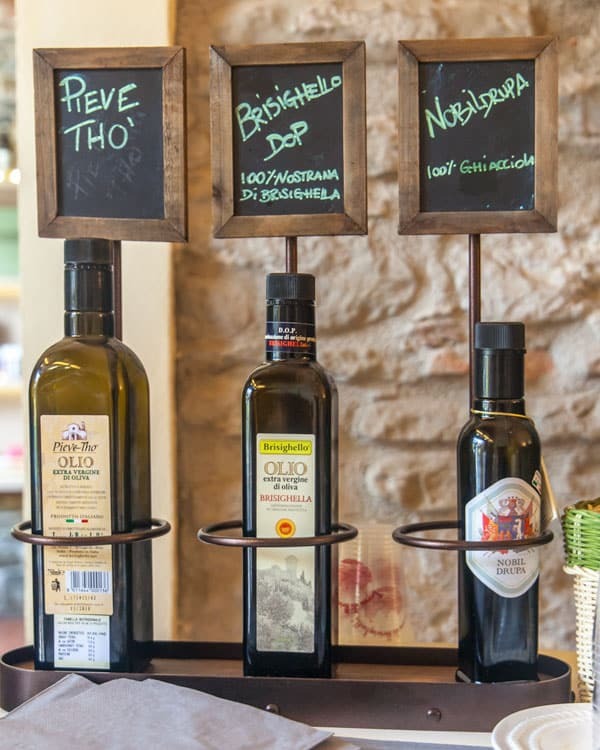 The small but well-stocked farmers cooperative in the heart of Brisighella is the perfect place to sample its prized product, Brisighello Olive Oil. These premium bottles, ideal accompaniments to pasta and salads, come in a variety of greens and clearer oils. Some have a peppery taste, others a more delicate finish, but all are equally delicious. Enjoy a sampling of a handful of the regions most excellent, and although bread will be offered, I learnt during my Spain food tour that sampling straight from the skin, and also smelling your skin to neutralise your senses, is the best way to do so. In this small store you can easily stock up on other regional food treats, and with Emilia Romagna likely being the best food destination in Italy, there is plenty to choose from. 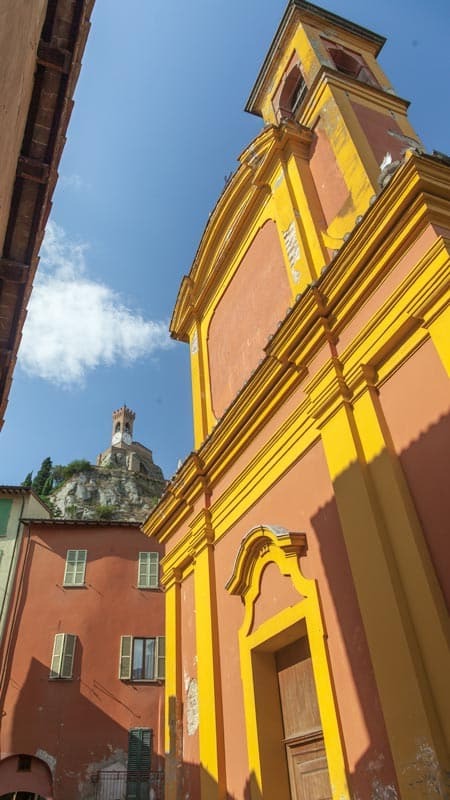 The colourful streets of Brisighella are, in my opinion, reason enough to visit. 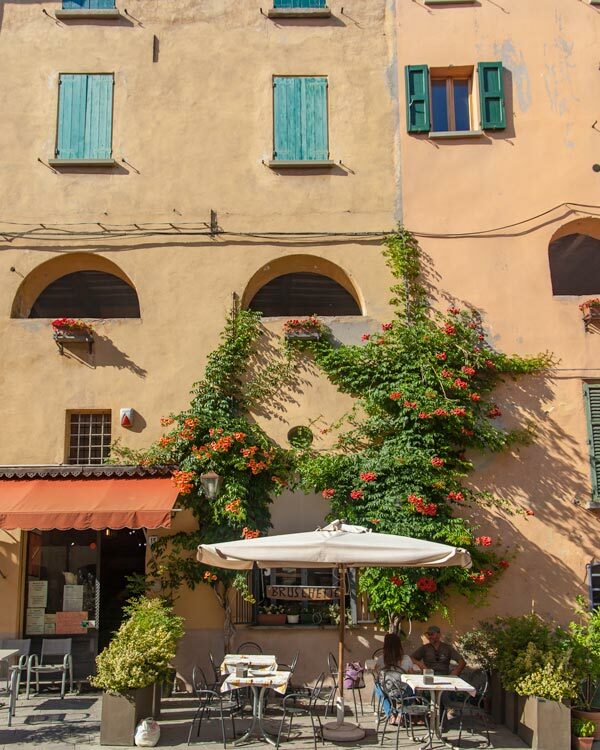 Not only is everything adorable, from the counter-top cafes to the colourful collections of flowers in plant pots, but as I’ve said above the streets are so quiet you really can soak up and photograph that dreamy Italian village vibe. 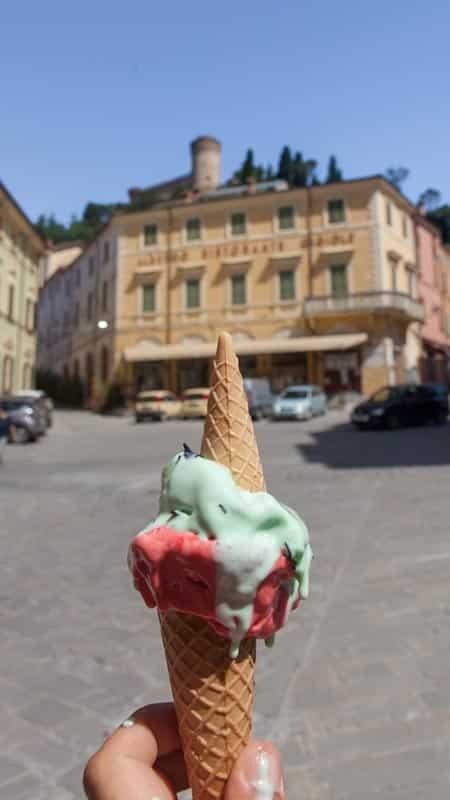 The village is small, with streets fanning out from the main piazza where you can follow in my footsteps by eating way too much gelato before lunch! 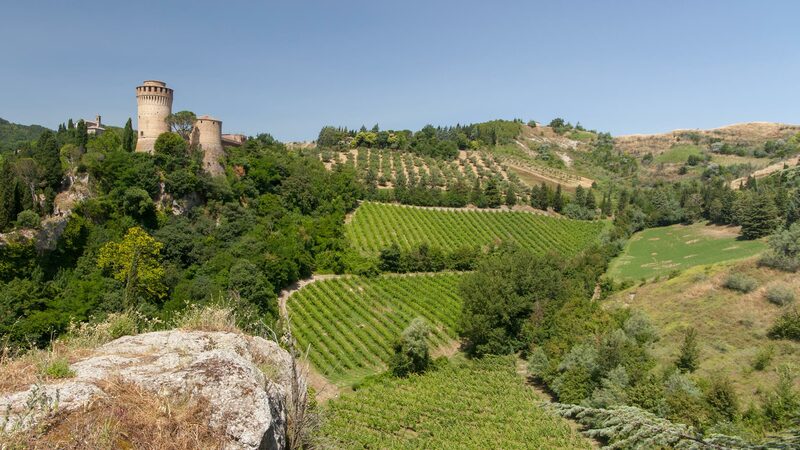 Beyond the warm coloured facades of Brisighella village are rolling hills, verdant vineyards, and the old mining quarry which has been repurposed. 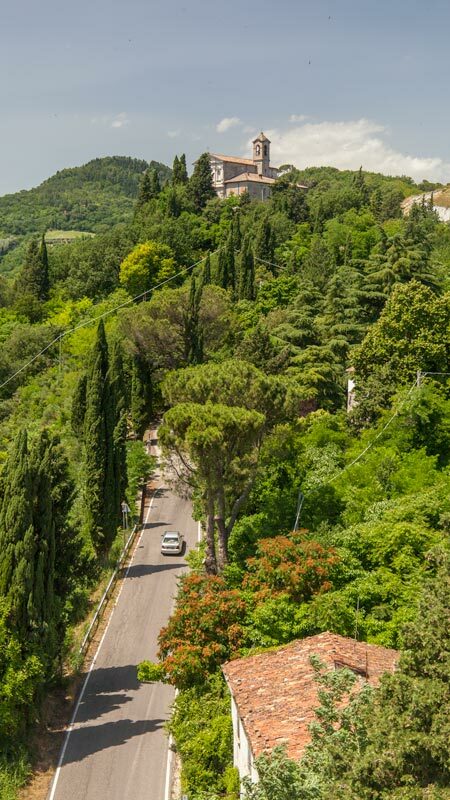 Avid walkers and hikers may be keen to explore these steep hills further, but to easily access some of the things to do around Brisighella, a car, or even a jeep, would be the best bet. Brisighella used to be a large mining town, especially for the Gypsum that lined much of the quarry. Nowadays, many of the large caves have been repurposed into different uses with one being an open-air geological museum. I got a short behind the scenes tour of some of the new attractions being opened here, including lifelike models of the mammals that have been excavated from the local area. It was incredible to see the discoveries that had been made here, a place that was once home to woolly mammoths and other prehistoric creatures. 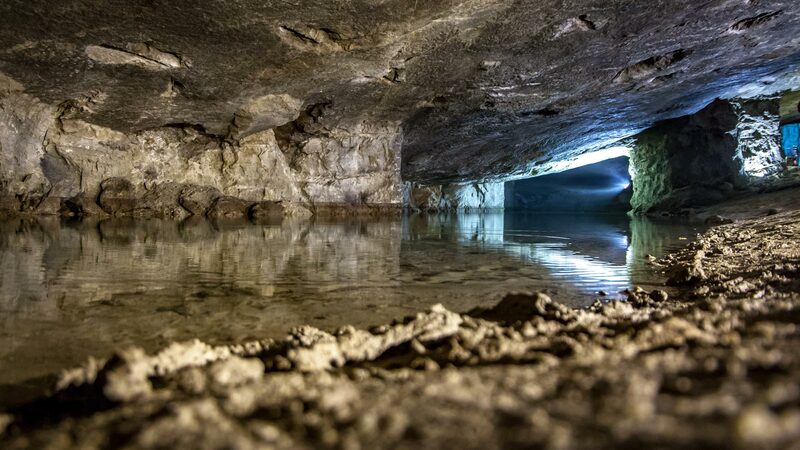 One of the coolest repurposings of the old caves though is a concert venue, where the acoustics are heightened thanks to the low ceilings and small puddles laying back the back of the cave. The calming landscape of the Parco Carnè wildlife park is a popular place for camping or hiking across the rolling mountains which look like a painting thanks to the array of colours which decorate them. 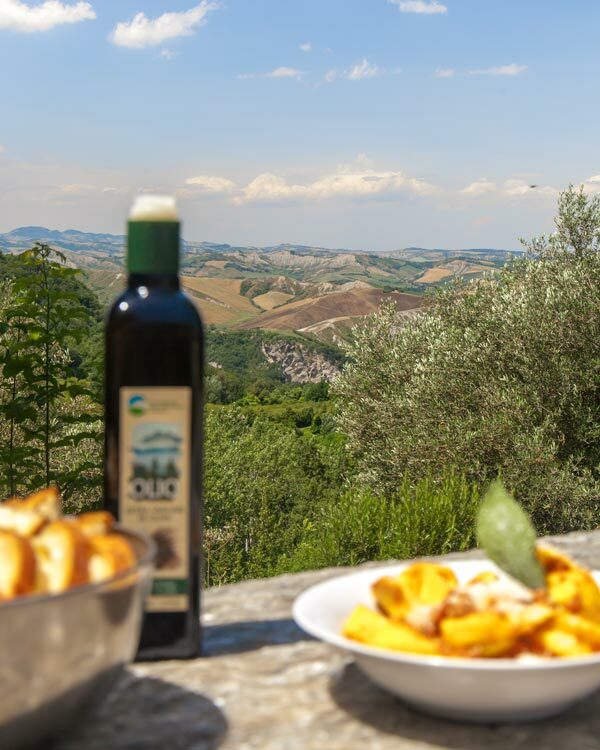 In the middle of the park, at one of the highest points, you’ll find a museum, camping area and restaurant which boasts some of the best views in Emilia Romagna. 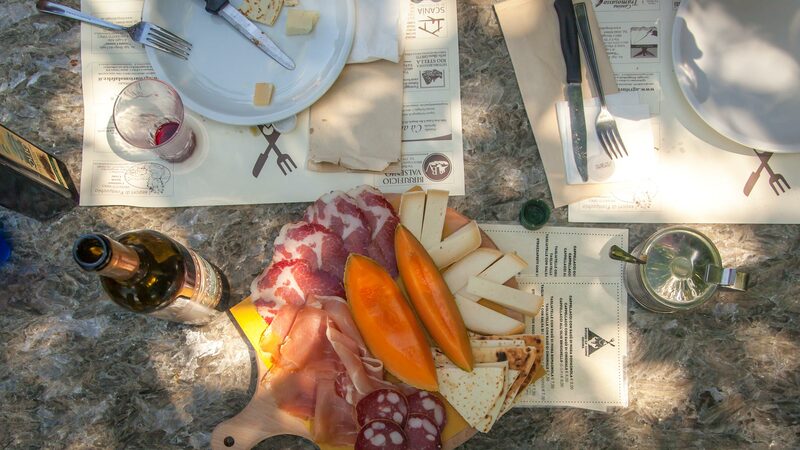 Here we dined alfresco on local produce, clinked tumblers together as we toasted local wines, and shared those broad smiles that only new friends in new places can draw out of you. This is one of the reasons I recommend having a car in Brishigehlla, is to allow you to visit here if you don’t have the time, or energy, to hike to the top. This might not be something to explore if you aren’t on an architectural pilgrimage, but deep in the over-grown woodlands lies the remains of a 10th-century castle where a team of dedicated graduates are slowly unearthing its ruins. The history of the area is so rich it is still being discovered. Thanks to our links at the tourism board, and the fact the team of dedicated students were here over this short period to document the site, I was able to have a little look at their ongoing work which hopefully will be more accessible to the public in years to come. 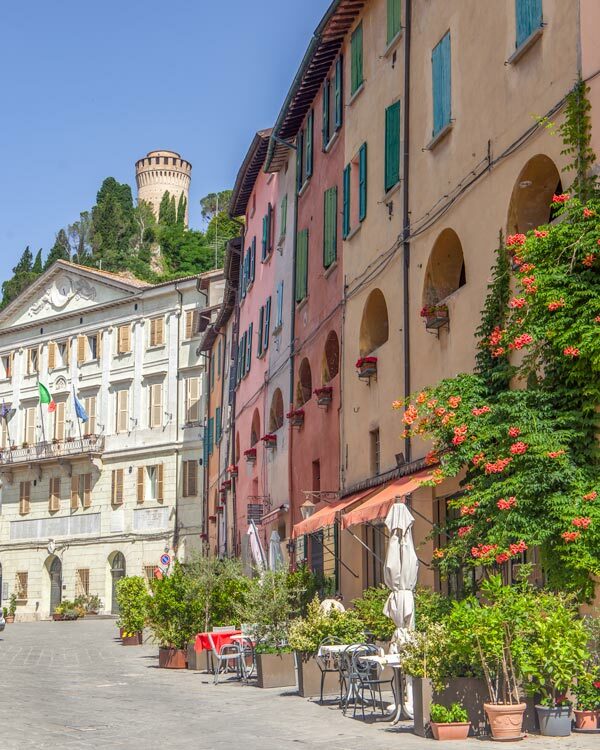 Brisighella isn’t content with just soothing your soul by its good looks and charming atmosphere, but it is a well-known spa town locally. Within just a few hundred metres of the old town, you’ll find the first Spa, using the natural waters of the mountains. 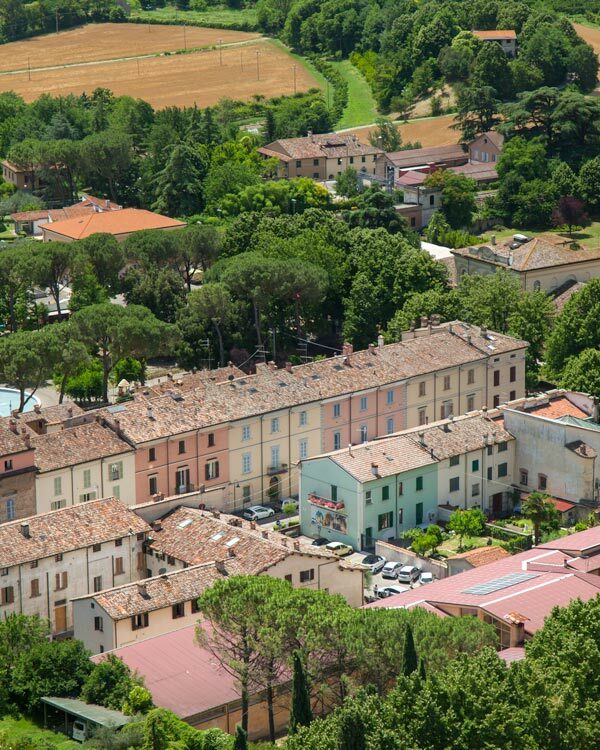 Wellness weekends are popular in these parts of Emilia Romagna, with Brisighella being known as both a ‘slow tourism’ and ‘agro-tourism’ destination. 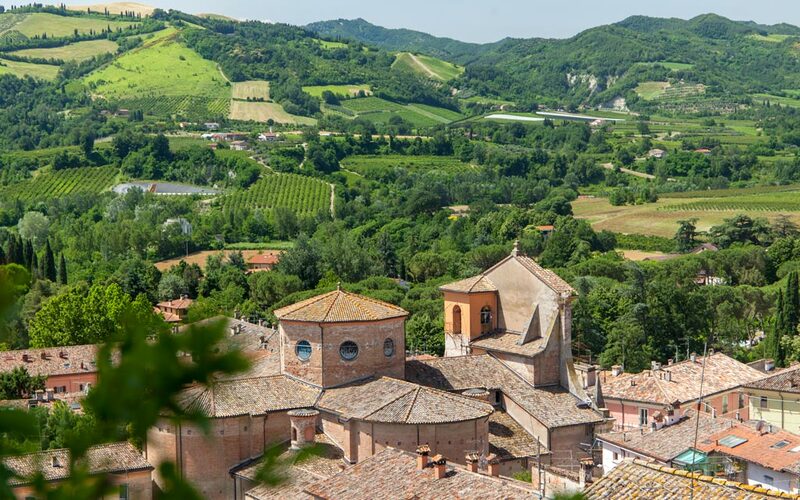 Some people who prefer city life might prefer to base themselves in nearby cities to visit Brigishella, and you have two clear options close, while a day trip from Bologna is another option. Faenza is, of course, the closest of the cities, and although my time here was brief, I learnt it is a passionate producer of earthware and pottery. 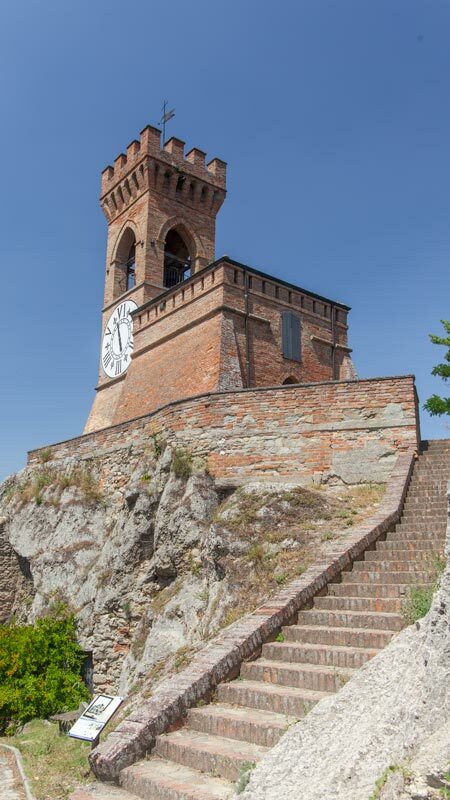 Ravenna is likely a much more interesting base for tourists though, especially given it is home eight UNESCO listed sites with some of the most famous dating back to the 6th-century. The gorgeous tiles, octagonal Basilicas and fascinating Mausoleos make Ravenna somewhere that my short day trip to was never going to be enough time! 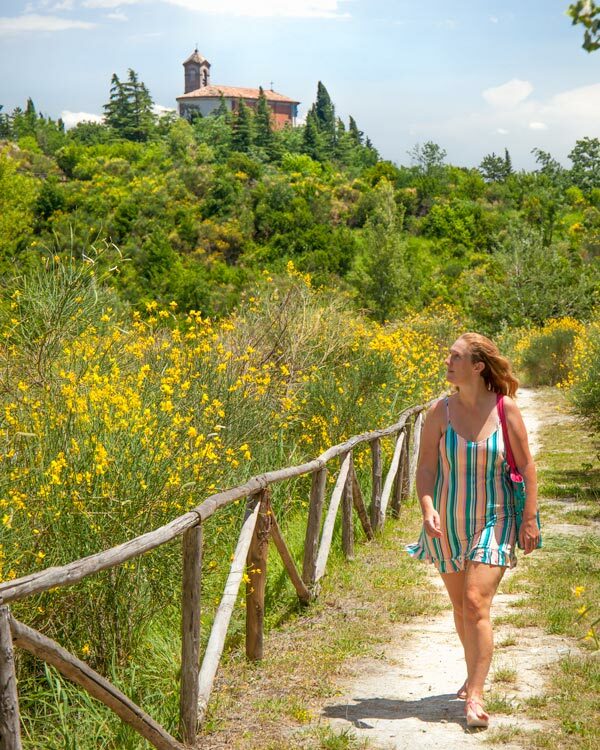 A few tips and insights to make planning your visit to Brisighella a little easier but as always, remember to find your personal discoveries too! 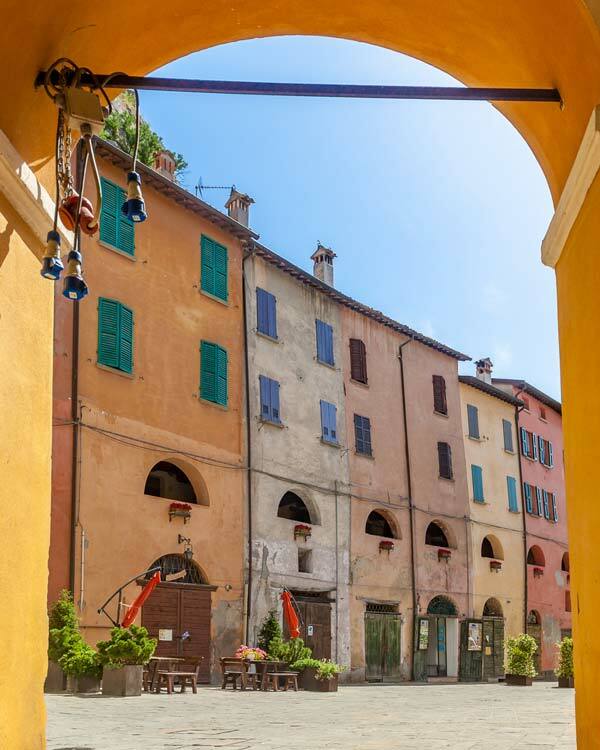 Where to stay in Brisighella on a budget: There isn’t that much accommodation in Brisigehlla given the compact size, but the family-run B&B Il Conventino offers clean and comfortable double rooms from around €50 a night in the off-season a short walk from the centre. 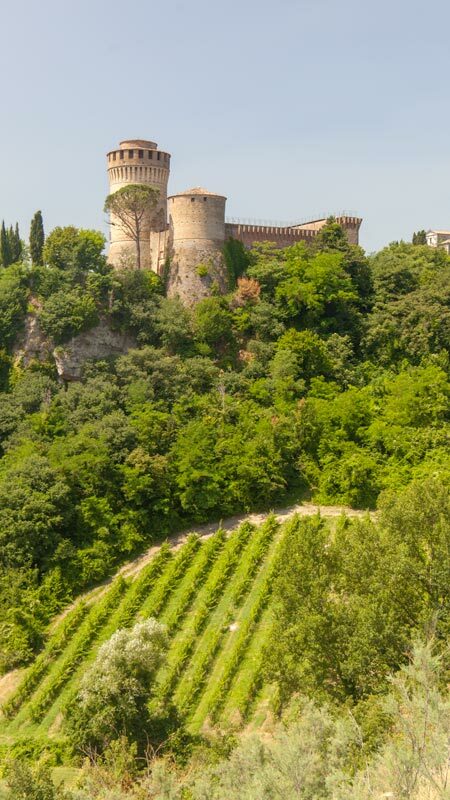 Where to stay in Brisighella: While much of the grander accommodation is in nearby cities, Bed&Wine offers another fantastic option nearby the medieval centre, with some great views from the terraces and the bonus of a well-stocked wine cellar. 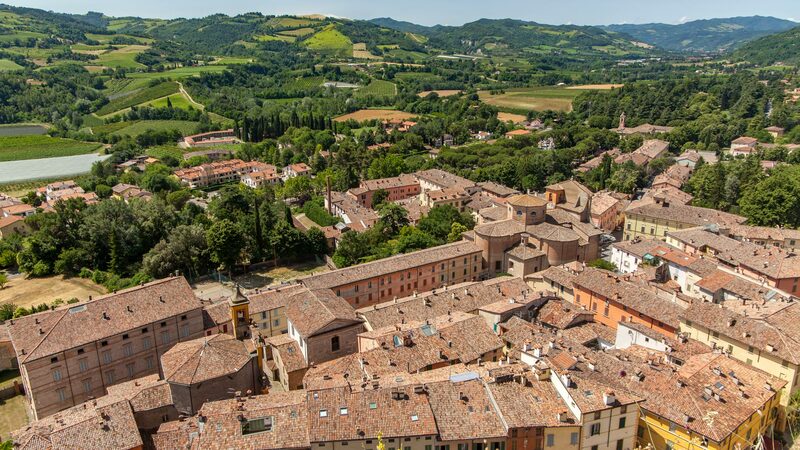 How to get to Brisighella: Brisighella does have a rail station, although it is not as often served as Faenza, from Faenza you can opt to take a 15-minute taxi if the less regular train connection doesn’t suit you. Driving from Bologna takes around one hour, while the quickest train journey is 45-minutes. 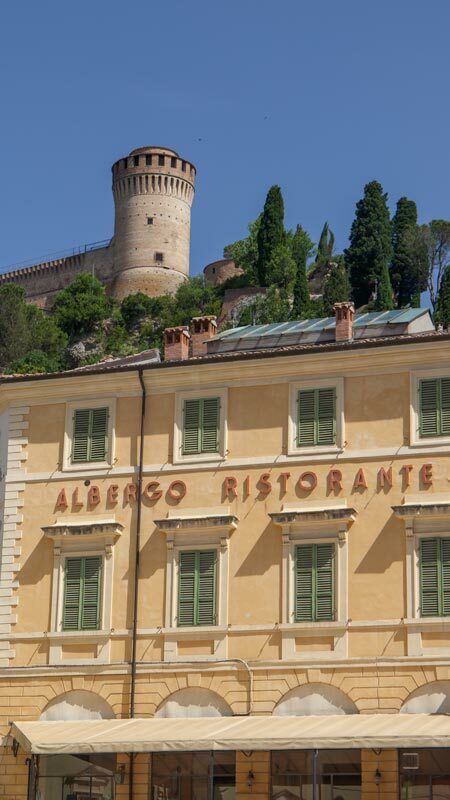 Where to eat in Brisighella: Ristorante La Grotta is impressive thanks to its location in the cave, and also on the upscale pricing level. 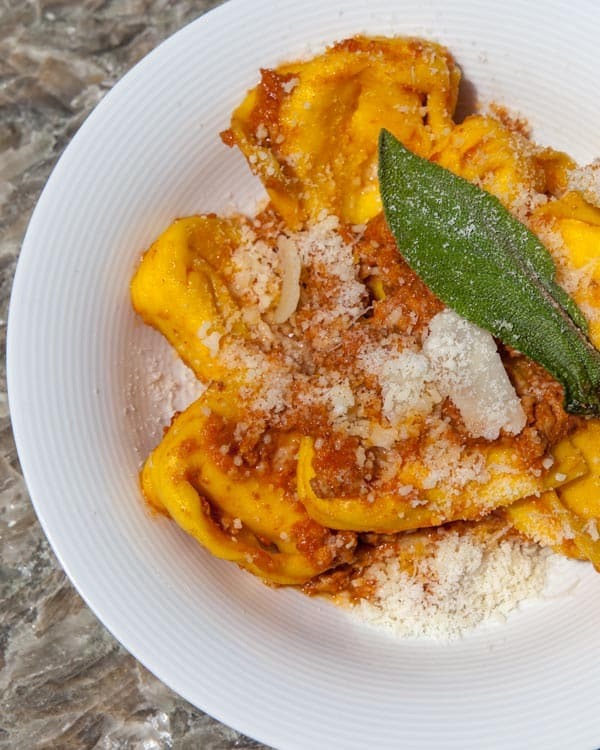 For a more authentic and affordable experience, head to Bruschetteria Torre where you might be tempted to opt for the signature Bruschetta, but the hand made pasta with Ragu is also delicious and great value here. 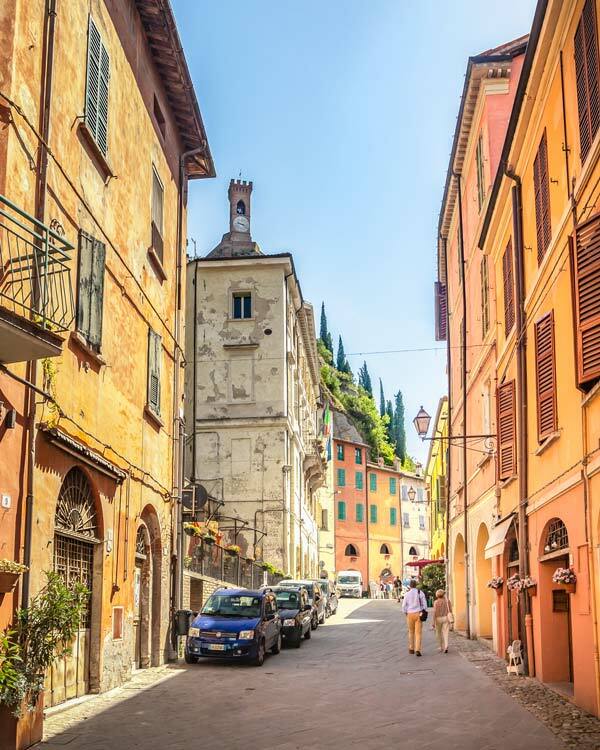 Where to go after Brisighella: After exploring the delightful village of Brisighella, you are spoilt for options with plenty of places to explore in Emilia Romagna – check out my Emilia Romagna must visits here. Accessibility in Brisighella: The village itself is quite flat, with step-free access to most of the cafes and restaurants we visited. To access the Tourism Office, there are stairs although the small team happily came out to give us advice when pointing things out. The paths between the tower and the castle are shingle and rock, and there are stairs to access the castle and up to the towers. Cars can drive from the village up to the tower and viewing platforms. I couldn’t find any detailed information on the local tourism website regarding accessibility information, but they do have contact details here. I was in Brisighella about 3 years ago and I absolutely loved the place. Loved the food and the people and enjoyed it even more than my time in Sicily. Great article. It’s truly one of the most special places in the whole country I think. I am wondering if you saw local taxis in Brisighella? We would love to do a day trip, but I cannot walk a lot and we will not have a car. So I wanted to see if we could, for example, take a cab up to the castle and just climb the steps to go in. Thank you for including accessibility info! Hi Dhara. I think I saw one yes, but can’t be 100% sure. There certainly were plenty of taxis at the train station of Faenza so I’m sure one of them must also work around the village. I think that would certainly work, but perhaps contact the tourism office on iat.brisighella@racine.ra.it – They were super helpful in there and I’m sure they might event be able to make transport arrangements for you if needed. Have a great time! I can’t believe I’ve never heard of this place! You’re right that the smaller, lesser known destinations are often better to visit. I’ll have to put this one on my list.